Travelwheels used campervan sales Sydney have this great Mitsubishi Express Campervan for Sale at our sydney depot. This is one of our used ex-hire small campervans for sale that are very popular with couples. Therefore this is the perfect vehicle for two people looking for practical, fun campervan at a good price. Call our team on 0421101021 to arrange a free test drive in Sydney. We love building small campervans for sale for our customers. Take this video for example which shows how we make these great campers! Here at our sydney depot you will find Marco our carpenter from German demonstrates the before and after shots for this used Mitsubishi Express Campervans for sale. 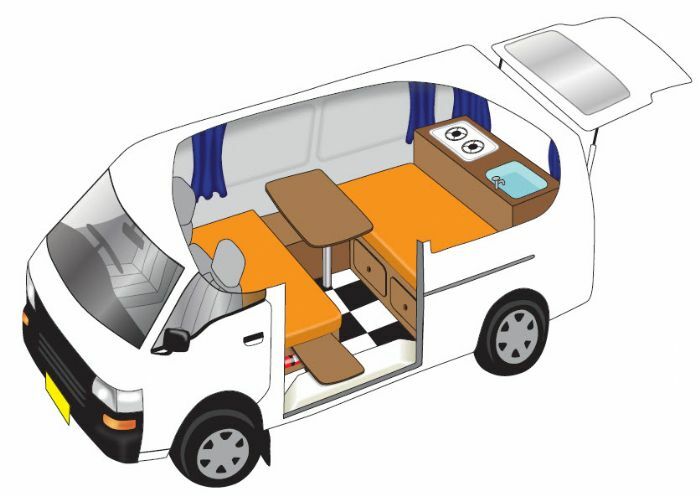 If for example you are looking for a camper with fridge, we can help you! Therefore this great used small campervan for sale has a 55 litre fridge included! Most of our competitors here in Sydney or private sellers only normally have an icebox! These great used campervans have a mini sink, water tank, 2 burner gas stove & gas bottle in the mini kitchen! It’s a practice design you will especially love. 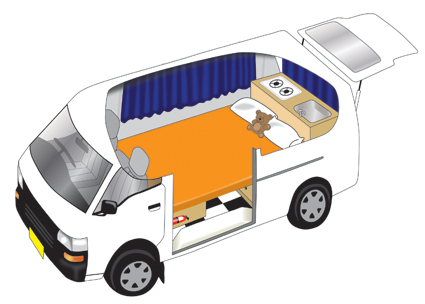 For example it has two benches and a table which converts into a big double bed. Why buy from Travelwheels used campervan sales Sydney? For more information about this used Mitsubishi Express campervan for sale in Sydney, email [email protected] You can call our team here in Sydney on 0421101021 to check what stock we have for sale. We are not an online business! Therefore you can visit us here in Sydney anytime. Here is our address to view our used campervan for sale at 11-15 Clevedon Street, Botany, 2019, Sydney. Du möchtest einen Campervan kaufen in Australien? Du kannst uns gerne auch auf Deutsch kontaktieren! Sende uns eine E-Mail auf Deutsch an [email protected] oder rufe uns kostenlos an unter 0421101021. Du findest uns auch auf Skype unter dem Namen Travelwheels!